Originally founded in 2011 by famed entrepreneur and founder of FIJI Water, David H. Gilmour, Wakaya Perfection joined the booming direct sales industry in 2015 when Co-Founder Todd Smith took the helm and moved operations from South Florida to Central Utah. Smith’s 20-plus years of experience in health and wellness have brought dozens of new and exciting products to the original products that still come exclusively from Fiji. In 2017, while on a site visit to a manufacturer’s location, Vice President of Operations Mike Casperson checked into the facility using a digital visitor management system, and he was intrigued. At Wakaya Perfection’s warehouse and offices, they regularly have distributors place orders online and then come by in person to pick up their orders. Various other visitors come to the company’s Lindon, Utah, corporate offices for appointments and meetings, and Casperson realized there was a better, more technologically advanced way to manage these processes. Casperson’s check-in experience at the manufacturer’s location set him on a search to find a system like the one he had used. 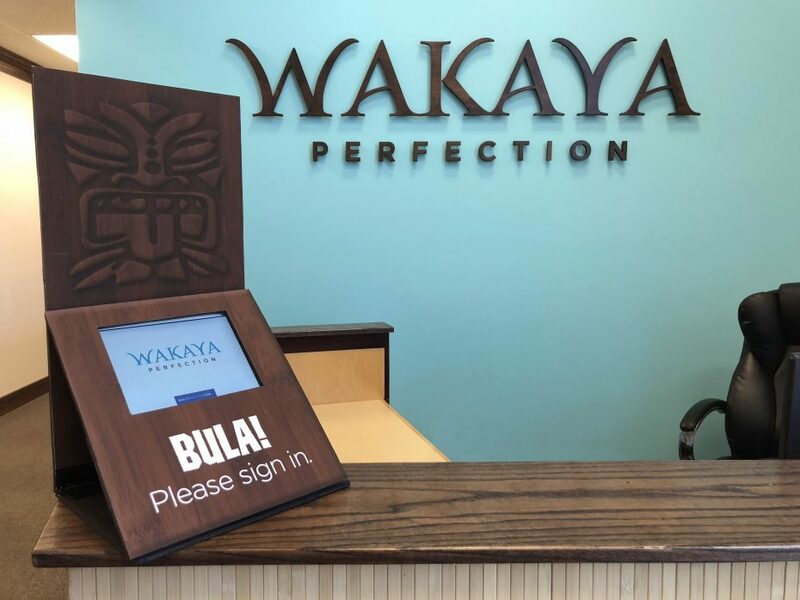 Casperson and Wakaya Perfection implemented The Receptionist for iPad in April 2018 with resounding success. Instead of having guests, visitors, and distributors sign in on a piece of paper at the front desk, they now check in using The Receptionist for iPad, which captures the digital signatures of each guest to confirm, for instance, that they are there to pick up an order. The system then notifies various employees throughout the building that a visitor has arrived and for what reason, making the process far more manageable for Wakaya Perfection staff. “It was such a relief to not require the front desk to be staffed, and to be able to have anyone step away from their office yet always be aware when a visitor came into the office and to receive a notification,” Casperson said. “We have multiple floors here — we have our big warehouse and then offices above that. It’s a significant amount of space, and there’s such an ease and comfort to know we can be anywhere within our building and get the notice that we have a visitor.